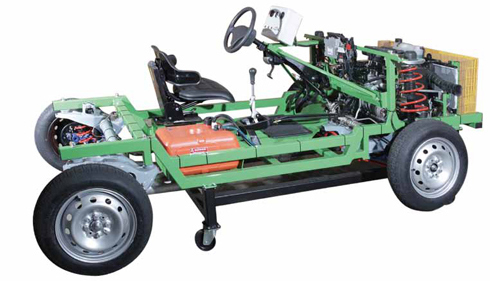 The chassis trainer is realised from a medium displacement vehicle which is particularly useful for the study of the main components, the repair operations and the diagnostic, by means of the OBD socket. All the mechanical parts are carefully revised and assembled on a chassis. This chassis allows an easy display and the possibility of assemble and disassemble each part. Engine, gearbox, clutch, brakes, lubricating circuit, cooling system, injection, ignition, suspensions, electric system, exhaust, etc. are completely functional.